While the spotlight typically shines brightest on American Flat Track’s premier AFT Twins class, the AFT Singles category has developed into an intensely competitive battleground in its own right. More than merely a feeder series (although it continues to excel in that role as evidenced by the recent graduations of Kolby Carlile and Brandon Price), Roof Systems AFT Singles presented by Russ Brown Motorcycle Attorneys has increasingly proven a destination point for leading manufacturers and teams. And as the Roof Systems AFT Singles grid has become swarmed by a healthy contingent of factory-supported outfits, the talent has followed suit. A growing trend has emerged that’s seen riders with impressive premier-class résumés move back to the undercard in order to represent those manufacturers and hunt race wins and championships. 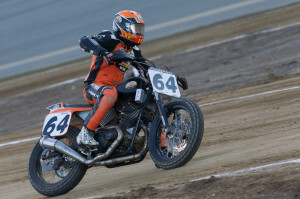 Reigning champion Dan Bromley was a top-five AFT Twins presented by Vance & Hines class Main Event finisher in ‘16 before finding his way back to the AFT Singles grid in ‘17. And after claiming that title in ‘18, rather than attempt to climb back up, he was signed to defend the #1 plate for an all-star Red Bull KTM Factory Racing squad alongside the class’ all-time winningest rider, Shayna Texter. Similarly, ‘16 AFT Singles champ Ryan Wells made a big impression as a premier-class rookie in ‘17 -- clocking finishes in the top-five and finishing just outside the top ten in points (slotted between proven commodities Henry Wiles and Jake Johnson) -- before returning to Singles duty in ‘17. He ultimately finished as runner-up to Bromley and continues in AFT Singles in 2019, signed by Estensen Racing with significant backing from Yamaha. And this season, two more big-name Twins riders have made the transition to Singles life: American Suzuki-supported Chad Cose -- who finished on the podium and took sixth in the AFT Twins championship a year ago -- and Mikey Rush, a long-time Twins top-ten finisher who was drafted in by Richie Morris Racing to spearhead American Honda’s long-awaited return to American Flat Track. Rush, for his part, wasn’t looking to become part of any trend. He simply jumped on a chance to do what was best for his career and his family. He said, “Basically, (the move to AFT Singles) came with the opportunity I was given by RMR. Having factory Honda involved... They haven't been involved since 1986, so I figured it'd be a cool thing to be a part of. And the AFT Singles class is getting really big; I thought that’d be pretty cool thing to be apart of too. “But the whole reason I took this deal was to have a good team behind me. I've been doing this all on my own the last several years. I’ve been working on my own bikes, building my own stuff, and putting everything in my van. I’ve been driving to the races, unloading everything myself, and getting on the thing to ride it. And I’ve been coming back in and making changes to the bike myself. 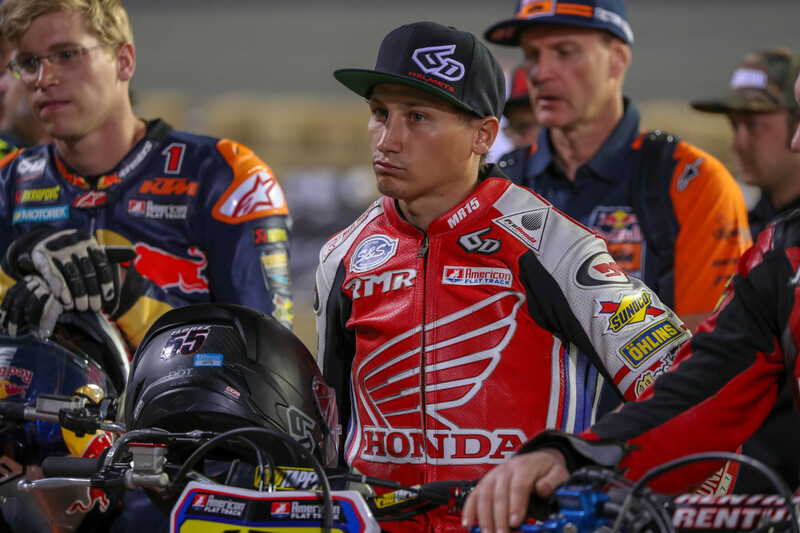 Rush got a taste of the factory rider gig during the second half of the 2018 season after being called in to sub for the iconic Harley-Davidson outfit. 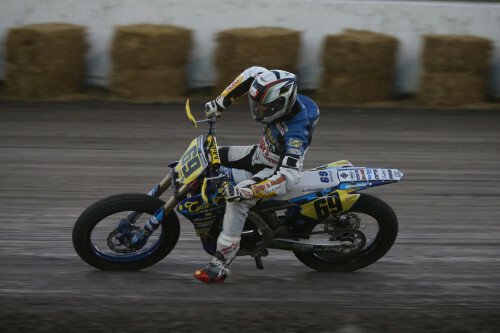 He repaid them with a pair of top-ten results, including a seventh at the Buffalo Chip TT. Following that experience, Rush was not exactly thrilled by the prospect of returning to the way things were. “The Harley guys took care of me big time,” he said. “Everyone with Harley-Davidson and Vance & Hines were awesome to work with. It was a cool deal to be a part of for a little bit. And I guess going back to doing it all on my own would be a little bit more stressful. “I've got a family back home. I've got two kids and a wife, so doing everything myself takes time away from them when I'm in the garage all day and all night. And then I've got to leave several days ahead of the race to drive to the races from California. Of course, considering how loaded the AFT Singles class is these days, there’s no cherry picking involved when moving down a class, even for experienced, proven riders. Pit up against a field stacked with potential race winners (there were ten different winners in ‘18 and almost as many in ‘17 when nine riders won -- and eventual champion Carlile wasn’t even among them), Rush understood what he was getting himself into to. In a twist of irony, Rush’s deal with RMR not only provided him more time to chase his kids around at home during the week, it’s resulted in him chasing other people’s kids around during the weekends as well. “I've raced with Dalton (Gauthier) quite a bit and he's a hell of a rider, and so is Dan Bromley. I like those two a lot -- they're really solid, safe riders. There are a few guys I've still got to get used to racing with. I'm an older guy -- I'm 31 years old, so I'm racing against the young guys now. So far the transition has proven relatively seamless. Rush has consistently been one of the quickest riders in the field, and he currently ranks fourth in points on the strength of fourth- and sixth-place finishes in the opening two rounds. He said, “Daytona was great, I thought. I was hoping for a podium, and we were just outside of that. I was coming on at the end of the event. I closed on Dan Bromley... I'm still trying to get used to the 15-lap thing -- I'm used to doing the 25-lappers. You've got to make things happen pretty quick. “I had bad starts all day long at Atlanta. I need to get out front sooner rather than later, because, like I said, a 15-lap race goes by really quick. It'll help a lot if I can get out quicker. My lap times were pretty good at Atlanta -- I think I was only a tenth or two off Dalton. I’ve just got to get off that line better. “We're going to build on our finishes at Daytona and Atlanta. Fourth and sixth are not what I'm looking for... not what I'm hoping for… But it’s a new team, new bikes, and there hasn’t been much time on the bike. It'll come to us. “But the whole RMR team is awesome. My mechanics have been busting their butts for me. James Hart just works all week long on the bike, and I've got Shane Hill, who’s an awesome dude, dedicated to me at the track. He's real particular and makes sure everything's good to go. RMR and Rush now have a bit of time to find some solutions to help make that a reality. 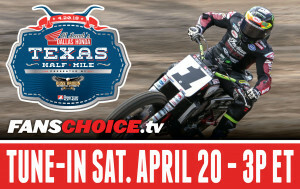 With the Al Lamb's Dallas Honda Texas Half-Mile presented by Russ Brown Motorcycle Attorneys just under two weeks away, Rush aims to make major strides with the set-up of his Honda CRF450R between now and then. He said, “I'm focused on doing a lot of testing these next few weeks with my suspension guy, Jimmy Wood, with Öhlins suspension. I'm going to get some Half Miles firmed up to rent and try to focus on doing some testing. Before the season, we didn't really get that much testing in at any groove tracks. So I’m going to try to get the suspension a little bit better, the bike a little bit better, and myself a little bit better.